N.O.S. is a U.S. DOT abbreviation for Not Otherwise Specified. The same term is used in other fields as well. DOT regulations require that a Proper Shipping Name (PSN) be used when labeling shipments of hazardous materials. In many instances, these will be generic (broad classes of) names such as "poisonous liquid, n.o.s. "; see below for specific examples. 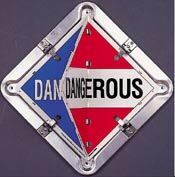 All physical properties and hazards in a package must be considered to comply with DOT regulations. These include the identities of the materials, the state of the items (liquid, solid, gaseous), whether the material is a solution, and if cryogens such as Dry Ice are used to maintain temperature. Once all materials and hazards are identified, DOT's Hazardous Materials Table (HMT), found in 49 CFR 172 is used to determine the proper shipping name. N.O.S. is used when the a chemical's name does not specifically appear in the HMT. For example, while ethanol appears in the table and has a proper shipping name of Ethyl Alcohol or Ethanol, an alcohol that is not listed specifically in the table will be described as "Alcohol, n.o.s" or "Flammable liquid, n.o.s". See the links under Further Reading below for how to comply with the DOT HazMat shipping regulations, including the selection of the proper shipping name(s). OSHA requires the chemical and common names of hazardous components to be listed on an MSDS, but the proper shipping name is not mandatory. However, sheets that are written according to ANSI's MSDS standard, the format recommended by OSHA, have sections dedicated to transportation information and regulations which will include the proper shipping name. Likewise, under OSHA's implementation of the Globally Harmonized Standard (GHS), proper shipping names will be required on the packaging. Hazardous Materials Shipping Guide, at the University of California, Irvine. 49 CFR 172 "Hazardous Materials Table, Special Provisions, Hazardous Materials Communications, Emergency Response Information and Training Requirements" at the US GPO. DOT's PHMSA HazMat Safety Community is chock full of HazMat shipping information. United Parcel Sevice's Guide for Shipping Ground and Air Hazardous Materials. See also: CAS Number, EINECS number, IUPAC, UN/NA number.